Me: So what do the kids want for Christmas, sis? Me: Really, that’s still a thing? Sister: Yeah, but they like the ninja one, the jungle one’s kinda stupid. Go ahead and guess which one is the "cool" one. As soon as I said, “Really, do kids still like Power Rangers?” I thought a little harder, and remembered it is a television show where a bunch of teenage ninjas given powers from an alien pilot animal-shaped vehicles and team up to be a karate-robot who beats up monsters. Now I can’t believe that’s not EVERY SINGLE SHOW ON TELEVISION EVER. Power Rangers – in its original American “Mighty Morphin” incarnation – debuted in 1993, just when I was moving out of weekday cartoons (Batman: TAS was wrapping up its initial run and would soon move along to WB on Saturdays). So I was a little too old for it. But looking back, I was still plenty interested in the space-ninjas-fight-monsters part. Amazingly, Bandai/Saban/Whoever-the-hell-else stumbled upon the greatest recasting technique since “Oh, he’s a Time Lord, so they just regenerate into entirely different people”: The “world peace conference” that allowed them to swap out the aging, wanting-more-money cast for new guys whenever required. I kind of liked that even they knew the actual “characters” were perfunctory. 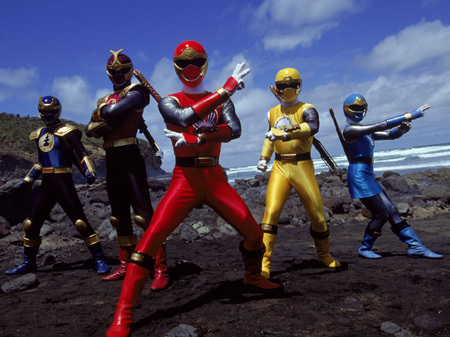 So yeah, given that you can just perpetually swap out those pesky “actors,” and keep buying whatever Japanese stock footage of multi-colored space-ninjas and call it a different thing, I can absolutely believe Power Rangers will continue to resonate with 8-year-olds. Particularly 8-year-old girls who are testing for their Red Belt this month (go Julia! ).